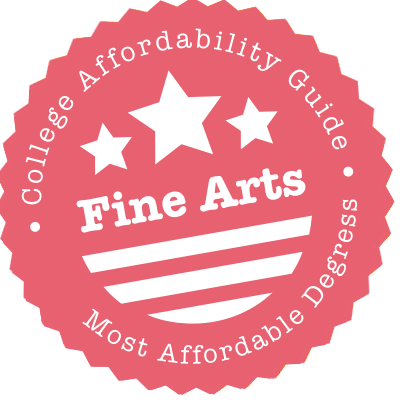 Scroll down to see the most affordable fine arts degrees, as well as info on the different types of fine arts degrees and fine arts program accreditation. The Claire Trevor School of the Arts at UC Irvine offers a Bachelor of Arts degree with the following areas of emphasis: painting & drawing, performance art, photography, digital filmmaking, electronic art and design, sculpture, and critical theory. Master of Fine Arts (MFA) degrees are available in art and in critical and curatorial studies. MFA in Art students can choose from the same undergraduate emphasis areas, but also from the following additional fields: feminist studies, Asian/American studies, and visual studies. Courses for the interdisciplinary MFA in Critical and Curatorial Studies program are taught by faculty from the School of the Arts and the School of Humanities. Undergraduate and graduate students can apply for the H.B. and Isabelle Yolen Memorial Scholarship ($2,000). The University of Minnesota-Duluth offers Bachelor of Arts, Bachelor of Fine Arts and Bachelor of Arts in Art History. The program is accredited by the National Association of Schools of Art and Design. The Bachelor of Arts in Art requires a second major or minor in another area and is a popular choice for those planning to continue to a professional graduate school. BFA students specialize in digital art and photography; general studio; painting, drawing and printmaking; or sculpture and ceramics. Students have additional creative outlets outside of classrooms, with organizations such as the Art History Symposium, Student Photography Cooperative and Mud Guild. Scholarships include the Art Mitchell and Schissell Scholarship and Dale C. Hagen Art and Design Scholarship. At Texas A&M, art programs are housed in the Department of Visualization within the College of Architecture. The Bachelor of Science in Visualization is an interdisciplinary, 120-credit program that includes classes in studio arts, visualization technology, art history, and programming. All viz majors are required to spend a semester away, either studying abroad or completing an internship. At the graduate level, students can earn a Master of Fine Arts or Master of Science in Visualization. The MFA program is one of the few in the U.S. that provides students with artistic insight combined with high-level technical skills. Nearly a dozen scholarships are available for viz students, including one created by Aggie visualization grads working at Pixar Studios. Many of the arts degrees offered by Rutgers University are housed in the Mason Gross School of the Arts, in New Brunswick, which is one of the most selective schools within Rutgers. Mason Gross students can pursue a Bachelor of Arts in Art or Bachelor of Fine Arts in Visual Arts. A Master of Fine Arts is also available. Visual art facilities include a lighting studio for photographng artwork, print shop, wood and metal workshops, individual studios, gallery space, and a specialized library. All new MFA students receive a scholarship equivalent to tuition for two years. The Camden and Newark campuses also grant an BA in Visual Arts, and Newark has a BFA and graphic arts program. The Art Department at the University of North Carolina-Chapel Hill maintains a small program that allows faculty to work closely with students. The studio art program offers a Bachelor of Arts and a Bachelor of Fine Arts, with emphasis in painting, sculpture, drawing, photography, electronic media, mixed media, and printmaking. Art History students can choose a Bachelor of Arts degree or combine studio courses with Art History for a BFA. Graduate programs include a Master of Fine Arts in studio arts and Master of Arts and Ph.D. in Art History. Summer research and international study opportunities are available. Scholarships include the George Kachergis Memorial Undergraduate Scholarship Fund, Penland School of Crafts Scholarship, and Marvin Saltzman Fund in Art. UCLA's School of the Arts and Architecture offers a Bachelor of Arts in Art degree that augments the studio arts core with interdisciplinary liberal arts studies. There are several studio arts fields for students to focus on, including ceramics, drawing and painting, photography, sculpture, and new genres. The Master of Fine Arts (MFA) program offered at the school is ranked as No. 4 in the country by U.S. News & World Report (2012). In addition to the MFA in Art degree, the school also offers an MFA in Design & Media Arts program. UCLA art majors can apply for several need- or merit-based financial aid, including the Alumni Arts Scholarship (freshmen and transfer students) and the US Regents Arts Scholarship (freshmen only). Continuing students pursuing a BFA in Art at UIC may qualify for Talent Tuition, a $3,000 assistantship that places studio artists in a lab 10 to 12 hours a week. The College of Architecture, Design, and the Arts (CADA) initiated the Vincent A. Paglione Fund, an endowment that helps CADA students finance study abroad. The School of Art and Art History runs an Arts and Social Change program in the Czech Republic as well as programs in Ghana and India. And thanks to a partnership with the Institut fur Alles Mogliche (which translates to "the institute for everything that could be possible"), MFA in Art History students can complete a summer residency in Berlin, complete with living and work spaces. Vassar's Art Department runs baccalaureate degrees in Art History and Studio Art, with each also available as a minor. The WK Rose Fellowship in the Creative Arts is a $45,000 award given each year to a talented and artistic graduate yet to be recognized in their field. Before all that, the department makes research assistantships available to undergrads - and there's a department Research Fund for Senior Essays, in addition to several other awards. Student organizations such as the Vassar Ceramics Club, and on-campus facilities such as the Frances Lehman Loeb Art Center and Vassar College Art Library, give undergrads at loose ends plenty of free activities to do. Earning a BA in Art at UC Riverside can be a fiscally sound decision. The school as a whole gives more financial aid to freshmen, on average, than any other public university. And the Bradshaw Endowed Award in Art makes sure upperclassmen with extraordinary talent continue getting financial support. Speaking of talent, BA and MFA students alike are encouraged to share theirs with local communities. The Gluck Fellows Program gives undergraduates $1,000 and graduate fellows $5,000 to teach and lead workshops. There's also plenty of time for creating and displaying - the Phyllis Gill Gallery's primary purpose is to showcase student work. The Department of Visual Arts at UC San Diego offers a Bachelor of Arts in Studio Arts program that combines hands-on experiences with technical and conceptual instruction. A Master of Fine Arts degree is also available. The MFA program provides training in several disciplines including environmental art, film, installation, painting, performance, photography, and sculpture. U.S. News & World Report (2012) ranks UC San Diego's MFA program as No. 13 in the country. A Doctor of Philosophy degree in art and media history, theory and criticism is offered. Students pursuing the PhD program can select artistic practice as their area of concentration. Fine arts majors can apply for the Visual Arts Endowment Scholarship ($4,000) and the Italo Scanga Memorial Scholarship ($2,000). Students at the University of Minnesota-Twin Cities find in-depth studio instruction in areas of ceramics, photography, sculpture, drawing and painting, printmaking, and experimental and media arts. The school offers a Bachelor of Fine Arts and Master of Fine Arts in these areas, with a general Bachelor of Arts available. International study is offered in China, Uruguay, Ireland and Germany. The school also offers the New York City Program, which culminates in a class exhibition in the city. Bachelor's, Master's and Doctoral degrees in Art History are also offered. Art History students have the option to gain hands-on experience in a museum setting and conduct scholarly research. The department offers competitive, merit-based scholarships. Through its Mason Gross School of the Arts, Rutgers University's Visual Arts Department offers a Bachelor of Arts in Art, a Bachelor of Fine Arts in Visual Art, a Bachelor of Fine Arts in Design and a Master of Fine Arts. The B.A. in Art focuses on the fundamental principles of visual art through studio and art history coursework. The B.F.A. in Visual Arts allows students to specialize their studies in one of seven concentration areas: design, drawing, media, painting, photography, print or sculpture. The M.F.A. is a 60-credit program in which students complete seminars in painting, sculpture, photography, media and printmaking. All M.F.A. students receive scholarships that cover the cost of full out-of-state tuition their first year and full in-state tuition their second year. The Department of Fine Arts at Buffalo State grants a Bachelor of Arts in Art or in Art History. The college also grants a Bachelor of Fine Arts for students who want to specialize in painting and drawing, photography, printmaking, or sculpture. The B.A. in Art program allows students to study a variety of visual media after taking introductory design and drawing classes. Art history majors often plan on continuing their studies in graduate school. Both B.A. programs require 42 art credits. The B.F.A. programs are more intense, requiring 78 art credits. Before being admitted to the painting and drawing program, students must submit a portfolio. B.F.A. students are required to mount an exhibition of their work before graduation. The Art Department at SUNY Oswego offers a Bachelor of Arts program and a more intensive Bachelor of Fine Arts program. The Bachelor of Art program offers a 40-credit track in studio art, graphic design, or art history. The Bachelor of Fine Arts in Studio Art requires students to earn 80 credits in major classes. They must also choose a studio concentration from ceramics, drawing, painting, photography, printmaking, or sculpture, and they must mount an exhibition of their work. Students seeking the B.F.A. in Graphic Design also must earn 80 major credits, and they are required to complete a graphic design practicum. Candidates in the master's program choose an emphasis in studio art or graphic design. At the University of California Berkeley, the fine arts fall into two departments. The History of Art Department grants a bachelor's degree and a minor. The Department of Art Practice grants a Bachelor of Arts and Master of Fine Arts and provides classes in individual media and interdisciplinary classes in new media such as game design and animation. The department has specialized studio spaces for work including painting, printmaking, sculpture, and digital media. It also has an art gallery with two exhibit spaces. The MFA is a two-year degree limited to 12 students per year. MFA tuition is covered for California residents, and others pay the out-of-state portion only. MFA students are also paid to teach undergraduate classes. The Bachelor of Arts in Fine Arts degree at UC Davis provides lower division students with a broad-based introduction to visual methodologies such as drawing, sculpture, and art history. Upper division students can specialize in the following: ceramics, drawing, media arts, painting, photography, printmaking, sculpture, and video production. There is also a two-year Master of Fine Arts degree available. Graduate students are given 24/7 access to spacious, individual studios on campus with facilities for drawing, painting, photography, printmaking, video, and sculpture. MFA students receive financial support through paid teaching assistantships and through the Art Studio Program Fellowships. Undergraduate students can apply for a number of scholarships including the Freemon Gadberry Award in Sculpture ($1,000) and the Marcia Carey Anti-Gravity Award ($1,000). Baccalaureate seekers at Westfield State's Art Department can pursue traditional concentrations in Fine Arts, Illustration or Art History or mix it up with more modern forms of expression, such as Graphic Design or Animation. Whatever the focus, internships are a key part of the Art Department's philosophy, with both on- and off-campus sites taking in students. One of the department's selling points is its partnership with Florence University of the Arts, which allows students to study abroad in Italy for up to a year. Back on campus, excellent artists may find their work displayed at the Arno Maris Gallery, which hosts four exhibitions each year plus an annual student show. Barnard College offers a bachelor's degree in art history, and students who major in art history also have the option of concentrating in visual arts. Art history students must take at least 12 courses within the major, while visual arts students take at least five studio art courses - such as painting, drawing, photography, and mixed media - along with some art history courses. Art history students must write a senior thesis or paper, while visual arts students may substitute a senior project, which will be exhibited at the end of their senior year. Because of Barnard's location in New York City, the Art History Department incorporates the resources of local galleries and museums into the art program. The Art Department at SUNY Oneonta grants a Bachelor of Science in Digital + Studio Art and has minors in art, computer art, and art history. The department's art studios were refurbished about a decade ago and include facilities for darkroom photography, sculpture, printmaking, and figure drawing. The campus also has two art galleries to display student work. Juniors and seniors can earn up to 15 academic credits for an internship, and the Casper Fellowship for Internship Support helps students pay for travel and living expenses incurred with an unpaid art internship. Art majors are eligible for several named scholarships, including the Martin-Mullen Scholarship and Lloyd Terrence Kennedy Scholarship, both based on financial need. Students pursuing a Bachelors of Fine Arts degree in Studio Arts at Appalacian State University can specialize in a concentration area of their choice: clay, fiber, metal smithing and jewelry making, painting and drawing, photography, print making, and sculpture. The Art Department also offers a Bachelors in Art Education for students who plan to become art teachers, a BFA in Graphic Design, and a Bachelor of Arts in Art and Visual Culture with concentrations in art history or art management. The Art Department is equipped with everything from a darkroom for photography students to plasma cutters and a forge for sculpture students. Art scholarships include the Martin and Doris Rosen Scholarship and the Sherry Edwards Memorial Scholarship (amounts vary). The University of Massachusetts-Amherst offers in-depth artistic instruction in areas of animation, ceramics, intermedia, painting, printmaking and sculpture. Students can choose a specialized Bachelor of Fine Arts and Master of Fine Arts in one of these areas or a Bachelor of Arts degree that will allow for a double major. The College of Humanities and Fine Arts also offers Bachelor's and Master's degrees in Art History. Amherst is part of the Five College Consortium, allowing students to take classes of interest at Smith, Mount Holyoke, and Hampshire colleges. The art departments offer an Advanced Studio Seminar, as well. The New York Professional Outreach Program connects students to working professionals in the city's art community. The Art Department at St. Cloud University prepares students to become art teachers, art historians and professional artists. Studio art majors can concentrate in 2D or 3D art, graphic arts or integrated media, which uses new and emerging technologies. Along with a faculty of working artists, students learn from visiting lecturers who lead workshops and meet personally with students to critique their work. Facilities include specialized studios for ceramics, metalworking, printmaking and digital work. Students also run an art gallery in downtown St. Cloud, providing extra exhibit space. Scholarships include the Jay Paul Bell and Julie Kiefer-Bell Art Scholarship ($500 to $1,000), the Bill and Sharon Ellingson Art Scholarship ($500) and the May Bowle Art Scholarship ($500). The Department of Art and Design at Wayne State College offers Bachelor of Arts and Bachelor of Science degrees in studio art that are accredited by the National Association of Schools of Art and Design. The program is designed for students interested in pursuing graduate work in art, as well as those seeking immediate employment as visual artists or in other fields of art. Students complete coursework in subjects like drawing, painting, printmaking, digital imaging, pottery, sculpture and art history. Students also participate in a senior exhibit the second semester of their senior year. Additionally, studio art majors are eligible for scholarship opportunities like the Special Abilities Art and Design Scholarship, which is awarded to incoming freshman who demonstrate exceptional abilities in art or design. The Bachelor of Fine Arts (BFA) degree at CSU Long Beach is offered in the following studio art programs: ceramics, drawing and painting, graphic design, illustration, photography, printmaking, sculpture, and 3-D media (fiber, metal, and wood). Students are required to submit a portfolio to be considered for any of these programs, and are given only two attempts to qualify. The College of the Arts (COTA) also offers a Master of Fine Arts (MFA) in Art degree with a concentration in studio art. The MFA program is designed to be completed within three years. A certificate program in museum and curatorial studies is also available. Each year, qualified continuing COTA students are considered for at least $60,000 worth of scholarships. The Art Department at Stony Brook University offers a Bachelor of Arts in Studio Arts degree with the following areas of concentration: painting, drawing, and printmaking, electronic media and photography, and sculpture and ceramic sculpture. Stony Brook also offers a Master of Fine Arts program that admits no more than 20 students each year. MFA students are given their own studio space during their residency at the university. Students have access to a ceramics studio, darkrooms, printmaking studios, digital labs and video facilities, and foundry, metals, and wood shops. Participation in the annual MFA exhibition at the University Art Gallery is a requirement of the program. Qualified MFA students can apply for paid teaching assistantships that award partial tuition scholarships. Art students at Castleton University can focus on studio art, photography, art history, or art education while pursuing a Bachelor of Arts in Art. Students have access to studios for printmaking, sculpture, and painting, and to a photography darkroom. A computer lab is available for graphic design and digital photography needs. Students also go off campus to visit exhibits and museums, including trips to Boston, New York City, and Montreal. The campus has a student gallery where seniors exhibit and a gallery that presents the work of professional artists. A student Art Club organizes studio tours and presentations by visiting artists. Many local organizations have a variety of internship opportunities for art students to gain professional experience. Students at the University of Florida interested in the arts can choose from Bachelor of Arts and Master of Arts in Art History, a Bachelor of Arts in Visual Arts, and Bachelor of Arts, Bachelor of Fine Arts, and Master of Fine Arts in Studio Arts. Disciplines offered include ceramics, creative photography, drawing, graphic design, painting, printmaking and sculpture. Art History is a research-based program with a senior seminar and individual research projects required. The Visual Arts degree is flexible to allow students to combine studio work with a double major outside the arts. The college offers a residential community for students in Reid Hall, with studio space and a gallery. Scholarships include the Amy Nicole DeGrove Memorial Scholarship. Berea College offers Bachelor of Arts degrees in studio art and art history. The B.A. in Studio Art requires three foundation courses, three studio courses (that include both 2-D and 3-D experiences) and a studio medium taken to the 400-level. The B.A. in Art History requires five foundation courses, three art history electives and a design course. It is also recommended that art history students complete three courses in a foreign language, like French or German. Students in both concentrations are required to complete a capstone course, with studio art majors completing a senior seminar and art history majors completing an advanced research course. The Art Department offers students various scholarship opportunities, including the Art and Art History Student Travel Award ($500) and the James Bobbitt Scholarship Fund. Alfred University's School of Art and Design offers a Bachelor of Fine Arts in Art and Design and a Bachelor of Science in Art History and Theory. Additionally, Master of Fine Arts programs are available in ceramic art, electronic integrated arts and sculpture/dimensional studies. The B.F.A. in Art and Design is available in several concentration areas, including ceramic art, art history, expanded media and sculpture/dimensional studies. Students can also complete the B.F.A. in conjunction with an art education minor. Students in all three graduate M.F.A. programs are required to submit a graduate art portfolio in an electronic format. Graduate students are eligible for financial assistance in the form of graduate assistantships and fellowships. The graduate program in art history at the State University of New York at Binghamton is known for its international, cross-cultural and interdisciplinary approach to the history of art, architecture and visual culture. The masters and doctoral programs in art history attract an international student body, training students for careers in research, teaching, gallery management and publishing. Undergrads at Binghamton can earn a bachelors degree in art history or in studio art. Studio art majors select a concentration from five areas: painting, drawing, printmaking, sculpture or graphic design. Visiting artists, a campus art gallery, and lectures and seminars all contribute to the lively art scene on campus. Available scholarships include the David P. Mancini Fine Arts Scholarship (amount varies). The Department of Art, Art History, and Design at Michigan State University places students in a multi-disciplinary environment in the Kresge Art Center, where they are surrounded by specialized art studios. Undergraduate programs include a BFA in Art Education, a BA in Art and Visual Culture, and BA or BFA degrees in Studio Art, with a concentration such as ceramics, electronic art, painting, sculpture, printmaking or graphic design. The intensive Master of Arts program allows a student to develop a body of work in ceramics, graphic design, painting, printmaking, or sculpture. Art majors may apply for a number of scholarships, including the Creative Arts Scholarships ($3,000 to $500) given to four students each year. The Art Department at Queens College offers bachelor's and master's degrees in art history, art education, studio art, and a bachelor's degree in design. Undergrads studying studio art can earn a 51-credit Bachelor of Arts or a 72-credit Bachelor of Fine Arts. The Master of Fine Arts in Studio Art is a 54-credit program. The Bachelor of Arts in Art History requires 36 credits, and the Master of Arts in Art History requires 30 credits. The Bachelor of Science in Design allows students to concentrate in Communication Design, Interaction Design, or Animation and Illustration. The 60-credit design program prepares students for careers or graduate study. Undergrads can also declare a minor in studio art, art history, or design. California State University Fullerton offers Bachelor of Fine Arts (BFA) in Arts and Master of Fine Arts (MFA) in Arts degrees in the following areas: ceramics, crafts (wood and jewelry/metalsmithing), creative photography, drawing and painting, glass, graphic design, illustration, and sculpture. Additionally, a BFA is offered in entertainment art/animation, while an MFA is available in exhibition design. The university also offers a graduate certificate in museum studies, which may be completed as a standalone program of study or in conjunction with an MFA degree. Full-time Art department students can apply for a number of scholarships, including the Jeff & Rosalie Bacon Scholarship ($2,000), the Millie & Dale Hallberg Scholarship ($5,000), and the Leo Freedman Foundation Graduate Art Scholarship ($5,000 to $10,000). Students who know they want to be a professional artist can apply for Brigham Young University-Idaho's Bachelor of Fine Arts program at the end of their sophomore year. BFA students can specialize in two-dimensional art (drawing and painting), three-dimensional art (sculpture and ceramics), graphic design, illustration or photography. BFA students take more art classes and go more in-depth than students pursuing a standard Bachelor of Arts in Studio Arts. BYU-Idaho offers a standard BA in Studio Arts with concentrations in printmaking, drawing, painting, graphic design, printmaking, three-dimensional art and illustration. The department also offers a BA in Art Education. BYU-Idaho awards Talent Scholarships based on a review of digital portfolios ($100 to $800 per semester). The Bachelor of Fine Arts (BFA) degree offered at Northwest Missouri State University is a comprehensive major that offers areas of specialization in art history, as well as in the following studio arts: ceramics, photography, printmaking, drawing, painting, and sculpture. There is also a BFA in Graphic Design degree available. Students accepted to the graphic design program are required to complete a summer internship, typically between their junior and senior year. The upper-division curriculum includes coursework in package design, 3D animation, graphic design history, digital illustration, and typography. BFA students specializing in ceramics and painting are given priority for the Hildegarde Dreps Scholarship ($1,500), while full-time art majors with excellent academic performance are considered for the Nany O'Reilly Art Scholarship ($5,000). The Art Department at the City College of New York grants degrees in all aspects of art. Bachelor of Arts degrees are offered in Studio Art, Art Education, and Art History, and a Bachelor of Fine Arts is available in Electronic Design and Multimedia. The Master of Art History program has three tracks: Art History, Art Museum Studies, or Art Museum Education. An M.A. is also available in Art Education, and Master of Fine Arts degrees are granted in Studio Art and Digital and Interdisciplinary Art Practice. The department has gallery space for art shows and has studio and work space equipped for painting, drawing, ceramics, photography, printmaking, and sculpture. Multimedia design students have access to fully equipped computer labs. Hunter College offers degrees in studio art and in art history. Students seeking a Bachelor of Fine Arts or Master of Fine Arts select a field of concentration: painting, sculpture, graphics, photography, ceramics, or combined media. The MFA is a full-time program that students must complete in three years. The college provides studio workspace to MFA candidates, and all MFA students must complete an MFA project which must be sponsored by a faculty member and placed in a formal group exhibit. The Art History program offers a Bachelor of Arts degree that requires students to take at least 30 credits in art history. Entry in the part-time Master of Arts in Art History is highly competitive. Students in the Department of Visual Arts at Texas Woman's University have access to modern, well-equipped studios to develop their artistic abilities. Degrees include a Bachelor of Arts and Master of Arts in Art History and Bachelor of Arts, Bachelor of Fine Arts, Master of Arts, and Master of Fine Arts in Studio Arts with concentrations in ceramics, graphic design, painting and drawing, photography, and sculpture. The Student Gallery offers exhibition space for students while the East and West Galleries host visiting exhibitions and qualifying student artwork. There are a number of extracurricular organizations for those with interest in a specific medium. Scholarships include the Thelma Merrifield Painter and Clarence Painter Endowment, Marie Delleney Memorial Scholarship and Sue E. Comer Art Scholarship. Art students at Brooklyn College can earn a Bachelor of Arts in Art or Art History or a Bachelor of Fine Arts in Art. The college also offers a Master of Arts in Art History and a Master of Fine Arts in Art. The college faculty includes distinguished artists, and many others come to campus as visiting artists or lecturers. Students have access to the city's museums and galleries and may be able to work as an intern for one of these institutions. The college has a specialized art library and a suite of art studios and workrooms, including digital labs and a printmaking suite. Departmental scholarships include the Cerf Scholarship in Art, open to undergraduate and graduate students. Students can choose studio concentrations in ceramics, drawing, graphic design, painting, photography, printmaking, or sculpture in the Bachelor of Arts and Bachelor of Fine Arts programs at State University of New York-Plattsburgh. BFA degrees include a portfolio review for admission, additional studio courses, and completion of a senior exhibition. The BA studio degree allows for a student to pursue a second major. BA students may also choose to specialize in art history. The school offers studios for each study area and the Plattsburgh State Art Museum hosts numerous exhibitions throughout the year. Scholarships include Winkel Scholarships and Internships, Jane Prescott Rowlson Award, and the Elliot D. Allen Award. The University of North Texas offers a BFA degree in ceramics, drawing and painting, fibers, metalsmithing and jewelry, new media art, photography, printmaking, and sculpture. They offer MFAs in all of the above concentrations as well. The College of Visual Arts and Design also offers both undergraduate and graduate degrees in art history, art education, and design. The CVAD is accredited by the National Association of Schools of Art and Design. UNT has been ranked in the top graphic design programs in the country by many sources. Students are eligible for the New Freshman and Transfer Student Scholarship as well as the Continuing Student Scholarship. The Bachelor of Fine Arts program at Stanislaus State University offers the following areas of concentration: graphic arts, mixed emphasis, painting, sculpture, and video and time-based media. The program is accredited by the National Association of Schools of Art and Design (NASAD). Foundation coursework include classes in drawing, printmaking, digital media, painting, sculpture, and art history. After the completion of the general education units and the foundation pre-requisites, students must submit a portfolio to be considered for admission to the BFA Major. The Art Department Freshman Scholarship considers gifted and academically outstanding first-year art majors. Continuing art students with demonstrable financial need can apply for the Jeffrey A. Pearl Memorial Scholarship. Award amounts for both scholarships vary from year to year. At Cal Poly Pomona, the Art Department is part of the College of Environmental Design. The department offers a Bachelor of Arts in Art History program that includes the study of global art (antiquity to present-day) and assists students with the development of skills in visual analysis and in the analysis of the cultural context of art. The curriculum includes coursework in the following: foundations of drawing, visual arts in the twentieth century, history of design, contemporary art, world art, and foundations of two-dimensional design. The Dian Divelbess Endowed Scholarship ($500) supports full-time Department of Art students who are in their junior or senior year. The scholarship is awarded on the basis of merit, regardless of the student's financial need. Experienced hands will tell you that art is a passion, not a profession. Yet, despite the starving artist label, many fine arts graduates earn incomes comparable to liberal arts majors. In 2013, the Wall Street Journal reported that the unemployment rate for recent MFA was just under 5%, with a median yearly income of roughly $50,000. On the flip side, artists often have to suffer through periods of economic insecurity, work multiple jobs and explore alternative career paths. Committed to the creative life? In our short guide to fine arts degrees, you’ll find a primer on programs at every level. Discover the difference between the BFA/MFA and BA/MA, refine your options by consulting our degree checklist and make an informed decision on the DFA. Since your job prospects may live or die on the basis of your school’s reputation, we also cover the importance of accreditation and the meaning of acronyms like NASAD, AICAD and the like. Note: For advice on subjects other than art & art history, check out our profiles of affordable Graphic Design, Drama/Theater, Music and Film, Video & Photography degrees. An Associate of Fine Arts (AFA) is a 2 year undergraduate program focused on the fundamentals of a fine arts field (e.g. painting, sculpture, dance, etc.). The AFA is offered by community colleges, universities, art academies and technical schools. It is usually a stepping-stone for students who want to earn a BFA or BA in fine arts. A high school diploma or the equivalent is required to apply. An AFA typically includes a mixture of fine arts courses (i.e. studio work) and liberal arts courses. You may find that art academies and technical schools concentrate on professional training. Some will include work opportunities and internships. Whatever choice you make, be sure your credits will be transferable to your favored 4-year programs. Looking for entry-level jobs that can help you earn money for your BFA? Consider working as a production assistant, photographer’s assistant, freelance musician, web designer, private tutor, etc. A Bachelor of Fine Arts (BFA) is a 4-5 year undergraduate program focused on visual arts or performance. You’ll find them in traditional universities, but also in art academies and technical schools. A high school diploma or the equivalent is required to apply. These highly competitive programs are available in any number of disciplines, including acting, creative writing, fashion, animation, musical theater, painting, photography, sculpture, ceramics, industrial design, film/TV production, etc. Since the BFA is a professional degree, you will often be required to submit a high school portfolio or perform auditions as part of the application process. A BFA degree starts with 2 years of introductory courses focused on fine arts (i.e. actual practice) and liberal arts (e.g. literature, history, psychology, math, etc.). After that, the program will concentrate more on practical work and internships. During this time, you can build your portfolio and present projects. Occasionally, studio coursework may lengthen a degree past 4 years. The BFA focuses on studio work and professional training supported by a program in general studies (~2/3s fine arts courses; 1/3 liberal arts). Students prepare to be working artists. The BA is a traditional university degree that focuses on the study of art, design, and art history in the context of a broader program of general study (~2/3s liberal arts courses; 1/3 fine arts). Preparation for a studio career is not the final endpoint. Since BFA and BA degrees often share core courses/electives, you may not have to make a choice of degree until after your 1st or 2nd year. Consult an academic advisor and mentors for help in making your decision. Some BFA and BA graduates become what you might expect – artists, art historians, actors, writers, film directors, dancers, photographers, interior designers, etc. But many others use their skills to work as advertisers, teachers, marketers, publishers, administrators and similar art-related professions. A Master of Fine Arts (MFA) is a 2-3 graduate year program focused on professional training in visual arts or performance. A bachelor’s degree is usually required, but it doesn’t necessarily need to be a BFA. The most critical part of your application will be your portfolio or performance audition. Like the BFA, MFA degrees are available in almost every arts discipline (e.g. writing, visual arts, graphic design, photography, filmmaking, theater, dance, etc.). The program often culminates in a major project or a performance. An MFA is focused on practice. The fine arts “core” is seasoned with occasional classes in liberal arts. This is a professional program designed for students serious about becoming artists. An MA is concerned with critical study and scholarship. The curriculum is more “academic” (e.g. 50% liberal arts courses and 50% fine arts). MFA and MA graduates become artists, art historians, art teachers, gallery managers, museum directors, curators, archivists and more. They may also ascend to management and directorship positions in their profession. One important thing to note – unless you’re studying music, the MFA is generally considered a terminal degree. That means MFA graduates can become full-time professors at the university level. Unfortunately, not all schools are aware of this fact. This has lead to the development of the DFA. A Doctorate of Fine Arts (DFA) is an academic program focused on high-level research and theory. Although doctorates are more common overseas, there are a small number available at U.S. universities. The goal of a DFA is to prepare students to teach studio work plus art history and critical theory at the university level (i.e. tenure-track positions). In theory, an MFA should be enough to qualify you for professorships. However, many hiring committees don’t understand that the MFA is a terminal degree. When looking at résumés, they often pass over qualified candidates. Note: An academic DFA is not to be confused with an honorary degree that has been granted to those who have made outstanding contributions to the arts. Certificates in fine arts are typically offered at the graduate level. Unlike the MFA, a certificate is a non-degree program that generally takes less than 1 year to complete. Certificates are composed of foundation courses in a specific area of interest (e.g. arts management, documentary film, digital photography, ceramics, etc.). Some may be available online. If you wish to earn certificate credit hours for a future MFA, make sure your credits will be transferable. Placement is key to building contacts. Los Angeles will connect you to up-and-coming artists, the film industry and computer animation; New York may be optimal for dance, stage acting and art restoration/museum work. Go where the action is. Does your fine arts program prepare you for employment? Train you for career certifications? Introduce you to movers and shakers? Networking is a huge factor in becoming a successful artist. Teachers can make or break an MFA program. Consider their body of work as professional artists, their industry reputation and their potential connections. For the money you pay, you deserve up-to-date technology and materials, high quality spaces (e.g. metalwork forges, painting studios, dance rehearsal rooms, etc.) and student support services. A number of institution-based scholarships and fellowships exist for promising artists. Don’t be afraid to ask what your school can offer. Regardless of whether you’re considering a BA/MA or a BFA/MFA, we recommend attending a school with regional accreditation. This is a “seal of approval” granted to non-profit and public institutions by one of six regional accrediting bodies (e.g. New England Association of Schools and Colleges). Regional accreditation only applies to the institution. For fine arts programs, you can also look for program accreditation from NASAD, AICAD and/or subject-specific accrediting bodies. The National Association of Schools of Art and Design (NASAD) establishes national standards for undergraduate programs, graduate degrees and related credentials for schools of art and design. In NASAD’s view, the term “schools” includes universities and colleges, but also post-secondary non-degree-granting schools for visual arts. It has approximately 323 accredited institutional members. In addition to NASAD, some art schools choose to be members of the Association of Independent Colleges of Art and Design (AICAD). This is a non-profit consortium of art schools in the U.S. and Canada. Membership is open to specialized colleges of art and design that are private, non-profit, free-standing, BFA and/or MFA degree-granting and accredited by NASAD and the appropriate regional accrediting agency. Over 70% of students in AICAD schools receive financial aid to support their education. When in doubt, consult your high school guidance counselor or undergraduate advisor for advice on appropriate accreditations.